My favorite little bird to eat with my fingers! I’ve created this Asian inspired quail dish with a sweet and sour sauce using plum wine and rice vinegar, a crispy slaw and sweet fruity pineapple salsa. It makes a great first course. Add the quail to a zip lock bag and pour all marinade ingredients in and refrigerate overnight. Remove the bag of quail and bring to room temperature one hour before cooking. Heat the 1 quart canola oil in a fryer or pot to 350 degrees. Pat the quail dry with a paper towel then season with salt and pepper and set aside. Have three bowls ready and add the flour to one, the eggs to another, and the panko to the third bowl. In this order: Coat the quail in the flour, and shake off the excess, then place the quail in the egg bowl, and coat with egg, then add the quail to the panko and coat on all sides. Place the quail in the hot oil and fry until light brown on both sides. Remove the quail to a foil lined pan and season quickly with salt and pepper. Once all the quail have been browned, place the tray in the oven and roast the quail for approximately 17 minutes. Over medium heat, add the sugar and honey in a small sauce pot and reduce for about 5 minutes. Add the other sauce ingredients and reduce for about 15 minutes, stirring occasionally. Strain out the spices and orange peel, and discard them. Reserve the sauce in a small container in the fridge, overnight. Mix all the dressing ingredients and set aside for about 1 hour, or place in the fridge overnight and bring to room temperature before using. Add the slaw mix to a large bowl and pour the dressing over the mix and combine. Mix all the ingredients in a bowl, and set aside for 1 hour for the flavors to develop. 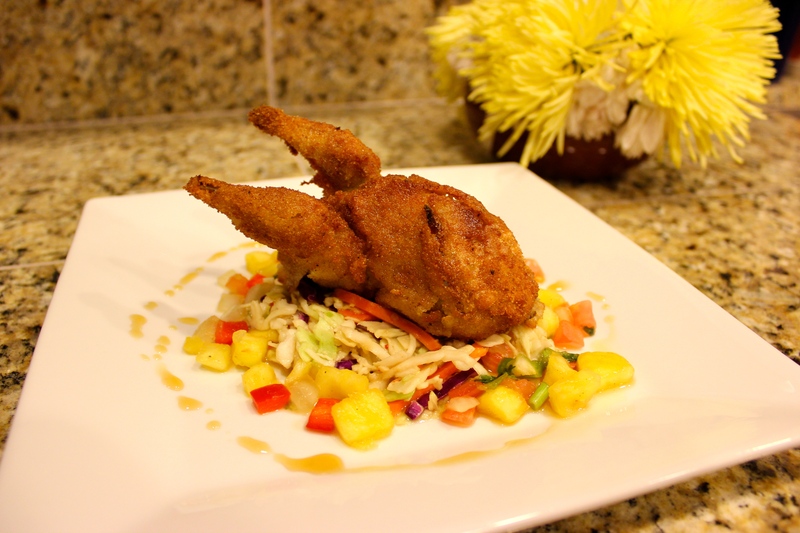 Once the quail have roasted, place a small portion of slaw on the center of the plate. Add some pineapple salsa on top. Then top it with a quail. Pour some Sweet and Sour Sauce around the plate OR in a small dipping bowl to dip the quail in. *If using the broccoli/carrot mix: It can be made 24 hours ahead BUT if using the cabbage slaw mix, add the dressing just before serving so it doesn't get soggy. The quail in marinade, sweet and sour sauce, slaw dressing, and salsa can all be made 24 hours ahead and refrigerated and brought to room temperature before serving. This cuts down on prep time and allows the flavors to develop.